Polycrystalline silicon core fibers (SCFs) fabricated via the molten core drawing (MCD) method are emerging as a flexible optoelectronic platform. Here, the optical transmission properties of MCD SCFs that have been tapered down to a few micrometer-sized core dimensions are characterized from the telecom band to the mid-infrared spectal regime. The SCFs exhibit low linear losses on the order of a few dB/cm over the entire wavelength range. Characterization of the two-photon absorption coefficient (βTPA) and nonlinear refractive index (n2) of the SCFs reveals values consistent with previous measurements of single crystal silicon materials, indicating the high optical quality of the polysilicon core material. The high nonlinear figure of merit obtained for wavelengths above 2 μm highlight the potential for these fibers to find application in infrared nonlinear photonics. J. Leuthold, C. Koos, and W. Freude, “Nonlinear silicon photonics,” Nat. Photonics 4(8), 535–544 (2010). J. Ballato, T. Hawkins, P. Foy, R. Stolen, B. Kokuoz, M. Ellison, C. McMillen, J. Reppert, A. M. Rao, M. Daw, S. Sharma, R. Shori, O. Stafsudd, R. R. Rice, and D. R. Powers, “Silicon optical fiber,” Opt. Express 16(23), 18675–18683 (2008). J. S. Orcutt, S. D. Tang, S. Kramer, K. Mehta, H. Li, V. Stojanović, and R. J. Ram, “Low-loss polysilicon waveguides fabricated in an emulated high-volume electronics process,” Opt. Express 20(7), 7243–7254 (2012). A. C. Peacock, U. J. Gibson, and J. Ballato, “Silicon optical fibres - past, present, and future,” Adv. Phys. : X 1, 114–127 (2016). E. F. Nordstrand, A. N. Dibbs, A. J. Eråker, and U. J. Gibson, “Alkaline oxide interface modifiers for silicon fiber production,” Opt. Mater. Express 3(5), 651–657 (2013). Y. Franz, A. F. J. Runge, H. Ren, N. Healy, K. Ignatyev, M. Jones, T. Hawkins, J. Ballato, U. J. Gibson, and A. C. Peacock, “Material properties of tapered crystalline silicon core fibers,” Opt. Mater. Express 7(6), 2055–2061 (2017). F. H. Suhailin, L. Shen, N. Healy, L. Xiao, M. Jones, T. Hawkins, J. Ballato, U. J. Gibson, and A. C. Peacock, “Tapered polysilicon core fibers for nonlinear photonics,” Opt. Lett. 41(7) 1360–1363 (2016). X. P. Liu, R. M. Osgood, Y. A. Vlasov, and W. M. J. Green, “Mid-IR optical parametric amplifier using silicon nanophotonic waveguides,” Nat. Photonics 4(8), 557–560 (2010). S. Zlatanovic, J. S. Park, S. Moro, J. M. C. Boggio, I. B. Divliansky, N. Alic, S. Mookherjea, and S. Radic, “Mid-IR wavelength conversion in silicon waveguides using ultracompact telecom-band-derived pump source,” Nat. Photonics 4(8), 561–564 (2010). A. D. Bristow, N. Rotenberg, and H. M. Van Driel, “Two-photon absorption and Kerr coefficients of silicon for 850 – 2200 nm,” Appl. Phys. Lett. 90(19), 191104 (2007). Q. Lin, J. Zhang, G. Piredda, R. W. Boyd, P. M. Fauchet, and G. P. Agrawal, “Dispersion of silicon nonlinearities in the near infrared region,” Appl. Phys. Lett. 90(2), 191104 (2007). X. P. Liu, J. B. Driscoll, J. I. Dadap, R. M. Osgood, S. Assefa, Y. A. Vlasov, and W. M. J. Green, “Self-phase modulation and nonlinear loss in silicon nanophotonic wires near the mid-IR two-photon absorption edge,” Opt. Express 19(8), 7778–7789 (2011). A. C. Peacock, P. Mehta, P. Horak, and N. Healy, “Nonlinear pulse dynamics in multimode silicon core optical fibers,” Opt. Lett. 37(16), 3351–3353 (2012). L. Lagonigro, N. Healy, J. R. Sparks, N. F. Baril, P. J. 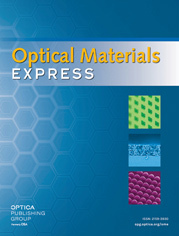 A. Sazio, J. V. Badding, and A. C. Peacock, “Low loss silicon fibers for photonics applications,” Appl. Phys. Lett. 96(4), 041105 (2010). M.-S. Rouifed, C. G. Littlejohns, G. X. Tina, Q. Haodong, T. Hu, Z. Zhang, C. Liu, G. T. Reed, and H. Wang, “Low loss SOI waveguides and MMIs at the MIR wavelength of 2 μm,” IEEE Photonics Technol. Lett. 28(24), 2827–2829 (2016). F. Gholami, S. Zlatanovic, A. Simic, L. Liu, D. Borlaug, N. Alic, M. Nezhad, Y. Fainman, and S. Radic, “Third-order nonlinearity in silicon beyond 2350 nm,” Appl. Phys. Lett. 99(8), 081102 (2011). P. Mehta, N. Healy, N. F. Baril, P. J. A. Sazio, J. V. Badding, and A. C. Peacock, “Nonlinear transmission properties of hydrogenated amorphous silicon core optical fibers,” Opt. Express 18(16), 16826–16831 (2010). H. Garcia and R. Kalyanaraman, “Phonon-assisted two-photon absorption in the presence of a dc-field: the nonlinear Franz-Keldysh effect in indirect gap semiconductors,” J. Phys. B 39(12), 2737–2746 (2006). L. Shen, N. Healy, P. Mehta, T. D. Day, J. R. Sparks, J. V. Badding, and A. C. Peacock, “Nonlinear transmission properties of hydrogenated amorphous silicon core fibers towards the mid-infrared regime,” Opt. Express 21(11), 13075–13083 (2013). N. Hon, R. Soref, and B. Jalali, “The third-order nonlinear optical coefficients of Si, Ge, and Si1−xGex in the midwave and longwave infrared,” J. Appl. Phys. 110, 011301 (2011). J. Zhang, “Anisotropic nonlinear response of silicon in the near-infrared region,” Appl. Phys. Lett. 91(7), 071113 (2007). A. M. Heidt, “Pulse preserving flat-top supercontinuum generation in all-normal dispersion photonic crystal fibers,” J. Opt. Soc. Am. B 27(3), 550–559 (2010). D. A. Coucheron, M. Fokine, N. Patil, D. W. Breiby, O. T. Buset, N. Healy, A. C. Peacock, T. Hawkins, M. Jones, J. Ballato, and U. J. Gibson, “Laser recrystallization and inscription of compositional microstructures in crystalline SiGe-core fibres,” Nat. Commun 7, 16265 (2016). H. Ren, O. Aktas, Y. Franz, A. F. J. Runge, T. Hawkins, J. Ballato, U. J. Gibson, and A. C. Peacock, “Tapered silicon core fibers with nano-spikes for optical coupling via spliced silica fibers,” Opt. Express 25(20), 24157–24163 (2017). L. Shen, H. Ren, and A. Peacock, “Dataset for Nonlinear optical properties of polycrystalline silicon core fibers from telecom wavelengths into the mid-infrared spectral region,” University of Southampton (2018), https://doi.org/10.5258/SOTON/D0710 . Fig. 1 (a) Schematic of the transmission setup. Beam-splitter (BS), microscope objective lenses (L1, L2 & L3), CCD Cameras (CCD1 & CCD2), optical spectrum analyser (OSA). Inset shows an optical microscope image of the tapered SCF, where the silicon core (black) is clearly visible. (b) Calculated dispersion profile of the polycrystalline SCF as a function of wavelength. (c) Linear loss measurements as a function of wavelength. Fig. 2 (a) Nonlinear absorption measurements for different wavelengths. The solid curves are simulated fits to the data for the corresponding wavelength given in the legend. (b) Measured TPA parameter as a function of wavelength extracted from Fig. 2(a), together with data points from previous measurements [10,11] in bulk silicon as labeled. Error bars represent the uncertainty in the input powers. Fig. 3 Experimental power-dependent transmission spectra as a function of pump center wavelength: (a) 1750 nm, (b) 1850 nm, (c) 1950 nm, and (d) 2150 nm. The dashed lines are numerical fits obtained by solving the generalized NLSE . The normalized spectra are offset for clarity. Fig. 4 (a) Wavelength dependence of the Kerr nonlinear coefficient n2 for the tapered SCF. Error bars represent the uncertainty in the input pulses. (b) Wavelength dispersion of the FOMNL. (c) Continuum generated by pumping in the normal dispersion regime.